We've seen that mass movements travel at a range of different velocities, from slow (creep) to faster (slumps, mud flows and debris ﬂows, and rock slides and debris slides) to fastest (snow avalanches, and rock and debris falls. The velocity depends on the steepness of the slope and the water or air content of the mass. For these movements to take place, the stage must be set by the following phenomena: fracturing and weathering, which weaken materials at Earth’s surface so that they cannot hold up against the pull of gravity; and the development of relief, which provides slopes down which masses move. jointing broke up this thick sandstone bed along a cliff in Utah. Blocks of sandstone break free along joints and tumble downslope. If the Earth’s surface were covered by intact (unbroken) rock, mass movements would be of little concern, for intact rock has great strength and could form stalwart mountain faces that would rarely tumble. But the rock of the Earth’s upper crust has been fractured by jointing and faulting (figure above), and in many locations the surface has a cover of regolith resulting from the weathering of rock. Regolith and fractured rock are much weaker than intact rock and can indeed collapse in response to gravitational pull. Thus jointing, faulting, and weathering ultimately make mass movements possible. Why are regolith and fractured rocks weaker than intact bedrock? The answer comes from looking at the strength of the attachments holding materials together. A mass of intact bedrock is relatively strong because the chemical bonds within its interlocking grains, or within the cements between grains, can’t be broken easily. A mass of loose rocks or of regolith, in contrast, is relatively weak because the grains are held together only by friction, electrostatic attraction, and/or surface tension of water. 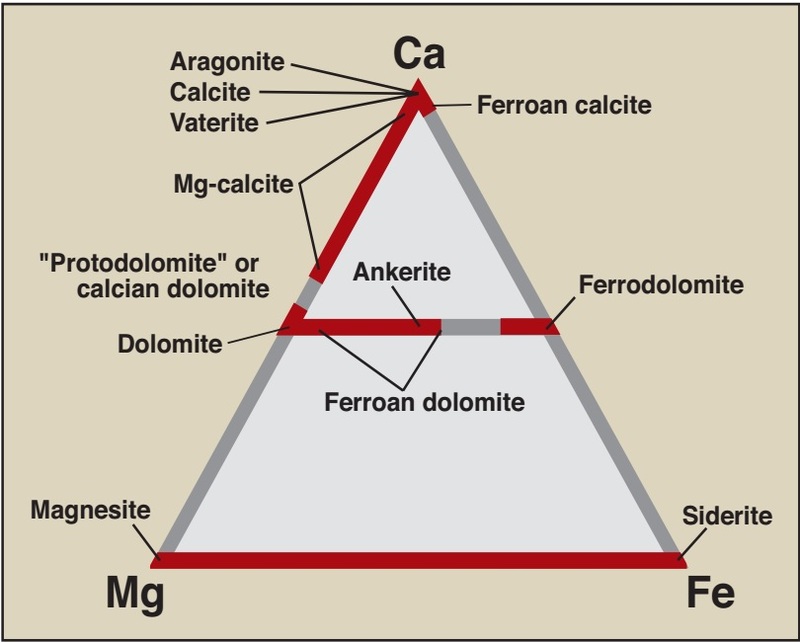 All of these forces combined are weaker than chemical bonds holding together the atoms in the minerals of intact rock. To picture this contrast, think about how much easier it is to bust up a sand castle (whose strength comes primarily from the surface tension of water ﬁlms on the sand grains) than it is to bust up a granite sculpture of a castle. Mass movements do not take place on all slopes, and even on slopes where such movements are possible, they occur only occasionally. Geologists distinguish between stable slopes, on which sliding is unlikely, and unstable slopes, on which sliding will likely happen. When material starts moving on an unstable slope, we say that slope failure has occurred. 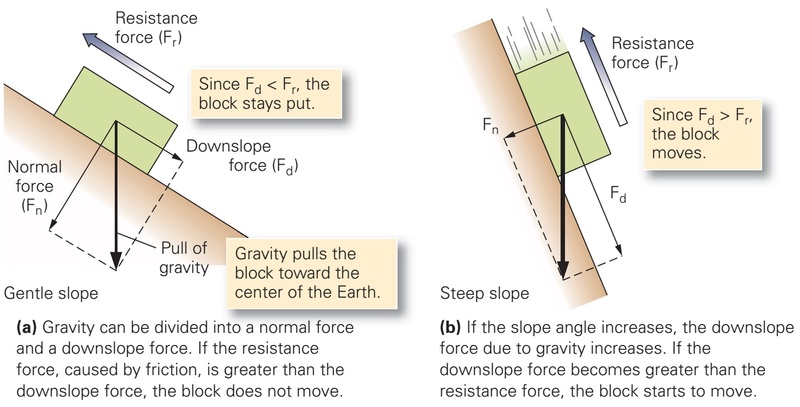 Whether a slope fails or not depends on the balance between two forces the downslope force, caused by gravity, and the resistance force, which inhibits sliding. If the downslope force exceeds the resistance force, the slope fails and mass movement results. Forces that trigger downslope movement. Let’s examine this phenomenon more closely by imagining a block sitting on a slope. We can represent the gravitational attraction between this block and the Earth by an arrow (a vector) that points straight down, toward the Earth’s centre of gravity. This arrow can be separated into two components the downslope force parallel to the slope and the normal force perpendicular to the slope. We can symbolize the resistance force by an arrow pointing uphill. If the down slope force is larger than the resistance force, then the block moves; otherwise, it stays in place (figure above a, b). Note that for a given mass, downslope forces are greater on steeper slopes. The angle of repose is the steepest slope that a pile of unconsolidated sediment can have and remain stable. The angle depends on the shape and size of grains. What produces a resistance force? As we saw above, chemical bonds in mineral crystals or cement hold intact rock in place, friction holds an unattached block in place, electrical charges and friction hold dry regolith in place, and surface tension holds wet regolith in place. Because of resistance force, granular debris tends to pile up to produce the steepest slope it can without collapsing. The angle of this slope is called the angle of repose, and for most dry, unconsolidated materials (such as dry sand) it typically has a value of between 30° and 37°. The angle depends partly on the shape and size of grains, which determine the amount of friction across grain boundaries. For example, steeper angles of repose (up to 45°) tend to form on slopes composed of large, irregularly shaped grains (figure above). Different kinds of weak surfaces can become failure surfaces. In many locations, the resistance force is less than might be expected because a weak surface exists at some depth below ground level. If down slope movement begins on the weak surface, we can say that the weak surface has become a failure surface. 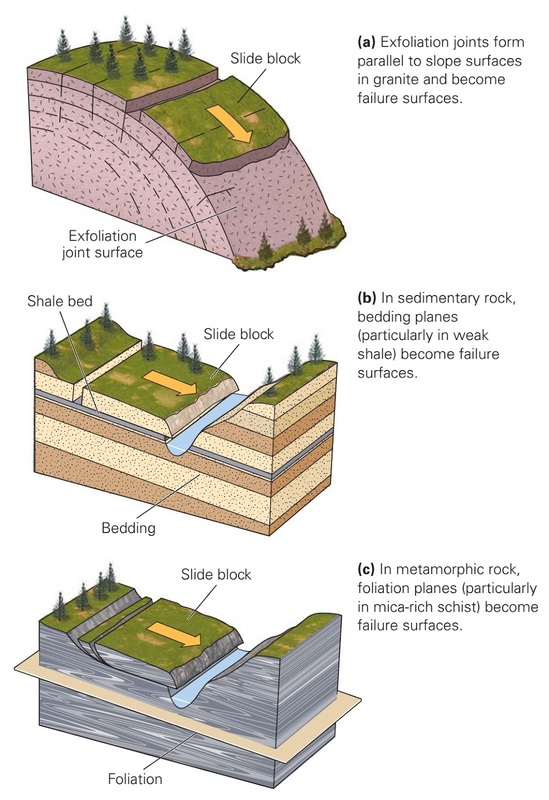 Geologists recognize several different kinds of weak surfaces that are likely to become failure surfaces (figure above a–c). 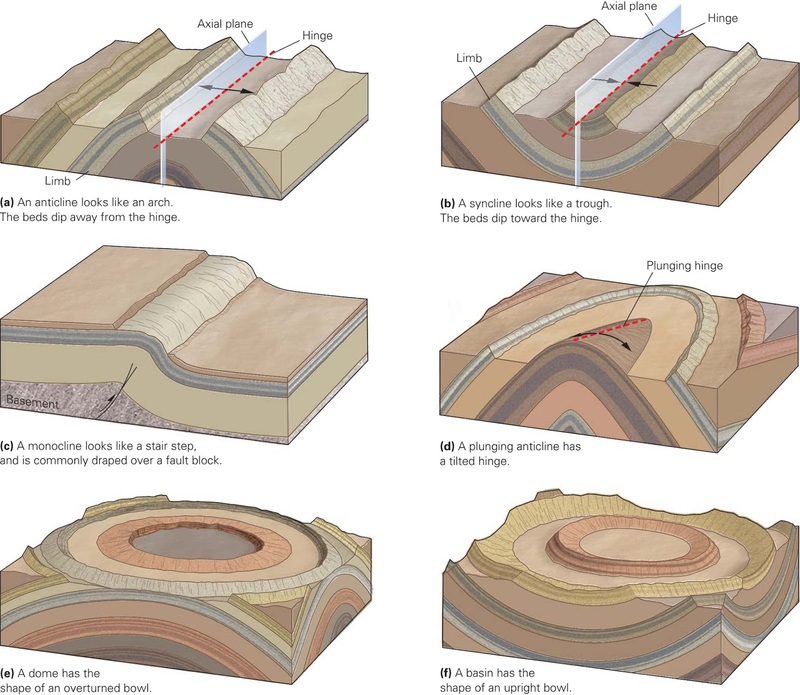 These include wet clay layers; wet, unconsolidated sand layers; joints; weak bedding planes (shale beds and evaporite beds are particularly weak); and metamorphic foliation planes. Weak surfaces that dip parallel to the land surface slope are particularly likely to fail. An example of such failure occurred in Madison Canyon, south western Montana, on August 17, 1959. That day, vibrations from a strong earthquake jarred the region. Metamorphic rock with a strong foliation that could serve as weak surfaces formed the bedrock of the canyon’s southern wall. When the ground vibrated, rock detached along a foliation plane and tumbled down slope. Unfortunately, 28 campers lay sleeping on the valley ﬂoor. They were probably awakened by the hurricane-like winds blasting in front of the moving mass, but seconds later were buried under 45 m of rubble. Fingers on the Trigger: What Causes Slope Failure? What triggers an individual mass-wasting event? In other words, what causes the balance of forces to change so that the downslope force exceeds the resistance force, and a slope suddenly fails? Here, we look at various phenomena natural and human-made that trigger slope failure. Earthquake tremors, storms, the passing of large trucks, or blasting in construction sites may cause a mass that was on the verge of moving actually to start moving. For example, an earthquake-triggered slide dumped debris into Lituya Bay, in south-eastern Alaska, in 1958. The debris displaced the water in the bay, creating a 300-m-high (1,200 ft) splash that washed forests off the slopes bordering the bay and carried ﬁshing boats anchored in the bay many kilometres out to sea. 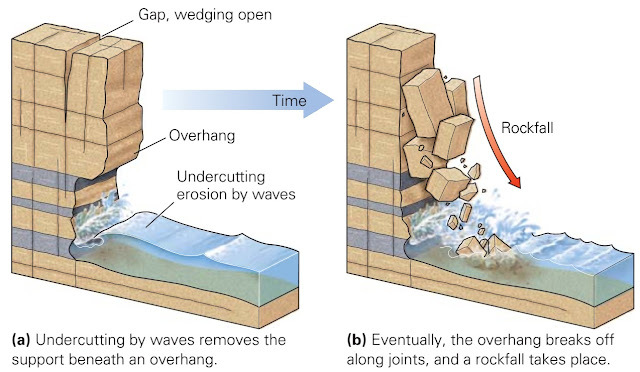 The vibrations of an earthquake break bonds that hold a mass in place and/or cause the mass and the slope to separate slightly, thereby decreasing friction. As a consequence, the resistance force decreases, and the downslope force sets the mass in motion. Shaking can also cause liquefaction of wet sediment by either increasing water pressure in spaces between grains so that the grains are pushed apart, or by breaking the cohesion between the grains. 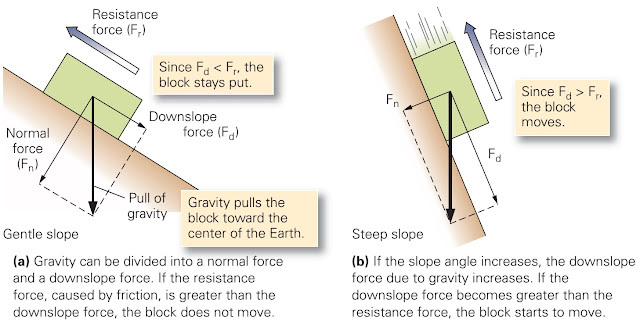 As we have seen, the stability of a slope at a given time depends on the balance between the downslope force and the resistance force. Factors that change one or the other of these forces can lead to failure. Examples include changes in slope loads, failure-surface strength, slope steepness, and the support provided by material at the base of the slope. Stages leading to the 1925 Gros Ventre slide in Wyoming. Slope loads change when the weight of the material above a potential failure plane changes. If the load increases, due to construction of buildings on top of a slope or due to saturation of regolith with water due to heavy rains, the downslope force increases and may exceed the resistance force. 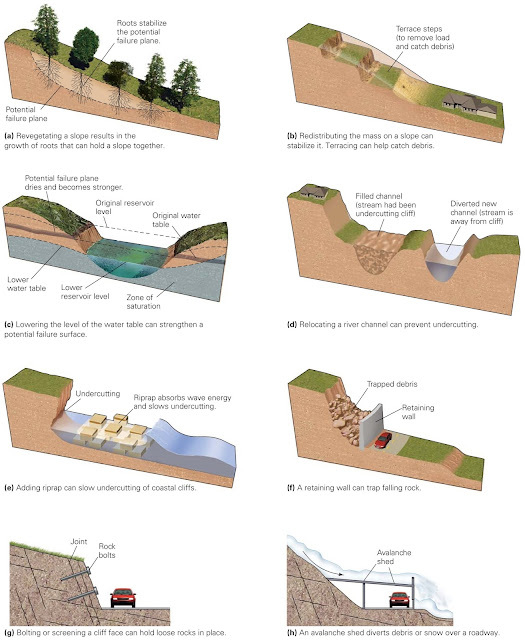 Seepage of water into the ground may also weaken underground failure surfaces, further decreasing resistance force. An example of such failure triggered the largest observed landslide in U.S. history, the Gros Ventre Slide, which took place in 1925 on the ﬂank of Sheep Mountain, near Jackson Hole, Wyoming (figure above). Almost 40 million cubic meters of rock, as well as the overlying soil and forest, detached from the side of the mountain and slid 600 m downslope, ﬁlling a valley and forming a 75-m-high natural dam across the Gros Ventre River. Removing support at the base of a slope due to river or wave erosion or to construction efforts plays a major role in triggering many slope failures. In effect, the material at the base of a slope acts like a dam holding back the material farther up the slope. Undercutting and collapse of a sea cliff. In some cases, erosion by a river or by waves eats into the base of a cliff and produces an overhang. When such undercutting has occurred, rock making up the overhang eventually breaks away from the slope and falls (figure above a, b). Weathering: With time, chemical weathering produces weaker minerals, and physical weathering breaks rocks apart. Thus, a formerly intact rock composed of strong minerals is transformed into a weaker rock or into regolith. Vegetation cover: In the case of slopes underlain by regolith, vegetation tends to strengthen the slope because the roots hold otherwise unconsolidated grains together. Also, plants absorb water from the ground, thus keeping it from turning into slippery mud. The removal of vegetation therefore has the net result of making slopes more susceptible to downslope mass movement. Deforestation in tropical rainforests, similarly, leads to catastrophic mass wasting of the forest’s substrate. Water content: Water affects materials comprising slopes in many ways. Surface tension, due to the ﬁlm of water on grain surfaces, may help hold regolith together. But if the water content increases, water pressure may push grains apart so that regolith liqueﬁes and can begin to ﬂow. Water inﬁltration may make weak surfaces underground more slippery, or may push surfaces apart and decrease friction. Some kinds of clays absorb water and expand, causing the ground surface to rise and, as a consequence, break up. Energy directly from the Sun: Solar energy, resulting from nuclear fusion reactions in the Sun, bathes the Earth’s surface. It may be converted directly to electricity, or it may be used to heat water. Energy directly from gravity: The gravitational attraction of the Moon, and to a lesser extent, the Sun, helps cause ocean tides, the daily up-and-down movement of the sea surface. The flow of water during tidal changes can drive turbines. Energy involving both solar energy and gravity: Solar radiation heats the air, which becomes less dense. In a gravitational field, this warm air rises, while cool, denser air sinks. The resulting air movement, wind, powers sails and windmills. Solar energy also evaporates water, which enters the atmosphere. When the water condenses, it rains on the land, where it accumulates in streams that flow downhill in response to gravity. This moving water can drive waterwheels and turbines. Energy via photosynthesis: Algae and green plants absorb some of the solar energy that reaches the Earth’s surface. Their green colour comes from a pigment called chlorophyll. With the aid of chlorophyll, plants produce sugar through a chemical reaction called photosynthesis. Plants use the sugar to manufacture more complex organic chemicals. Burning plant matter releases potential energy stored in the chemical bonds of organic chemicals. During burning, the molecules react with oxygen and break apart to produce carbon dioxide, water, and carbon (soot). People have burned plant material (biomass) to produce energy for centuries. More recently, plant material has been used to produce ethanol, a flammable alcohol. While a portion of our energy comes from recently living biomass (wood, sugar cane, etc.) even more comes from the remains of organisms that lived either by carrying out photosynthesis or by eating algae or plants, and were then buried and preserved in sediment after they died. Because the energy stored in these substances was trapped by photosynthesis long ago, and has been preserved in rock over geologic time, we refer to these materials as fossil fuels. Energy from chemical reactions: A number of inorganic chemicals can burn to produce light and energy. A dynamite explosion is an extreme example of such energy production. Recently, researchers have been studying electrochemical devices, such as hydrogen fuel cells, that produce electricity directly from chemical reactions. Energy from nuclear ﬁssion: Atoms of radioactive elements can split into smaller pieces, a process called nuclear fission. During fission, a tiny amount of mass transforms into a large amount of energy, called nuclear energy. This type of energy runs nuclear power plants and nuclear submarines. Energy from Earth’s internal heat: Some of Earth’s internal energy dates from the birth of the planet, while some comes from radioactive decay in minerals. This internal energy heats underground water. The resulting hot water, when transformed to steam, provides geothermal energy, which can drive turbines. Sources of energy used by people. The proportion of sources changed through time, but the total quantity used increases. Industrialization in Asia is now driving growth. 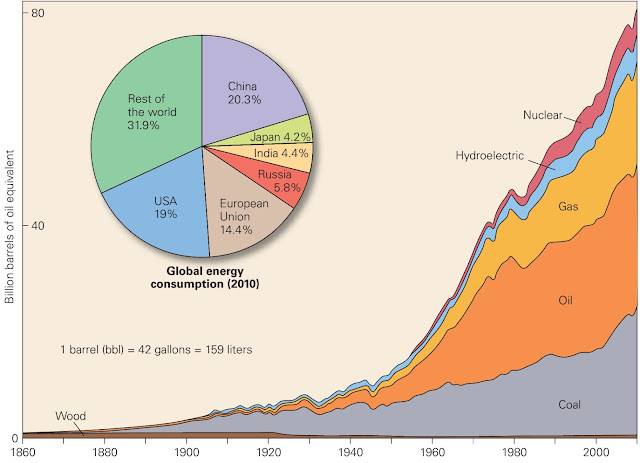 During the course of civilization, the sources of energy that people use have changed (figure above). Prior to the industrial age, direct burning of wood and other biomass provided most of humanity’s energy. But by the second half of the 19th century, deforestation had nearly destroyed this resource, and energy needs had increased so dramatically that other fuels came into use. The Cenozoic Era is focused which we know today of the world, the modern world. The two main active continental orogenic systems on the Earth today. 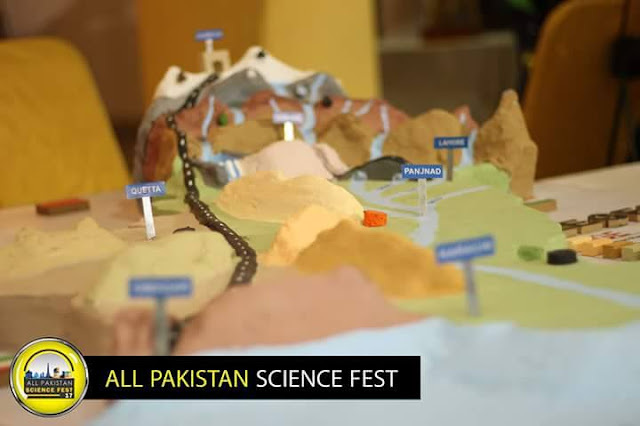 The Alpine-Himalayan system formed when Africa, India, and Australia collided with Asia (inset). The Cordilleran and Andean systems reﬂect the consequences of convergent-boundary tectonism along the eastern Paciﬁc Ocean. During the last 65 million years, the map of the Earth has continued to change, gradually producing the conﬁguration of continents and plate boundaries we see today. The ﬁnal stages of the Pangaea breakup separated Australia from Antarctica and Greenland from North America, and formed the North Sea between Britain and continental Europe. 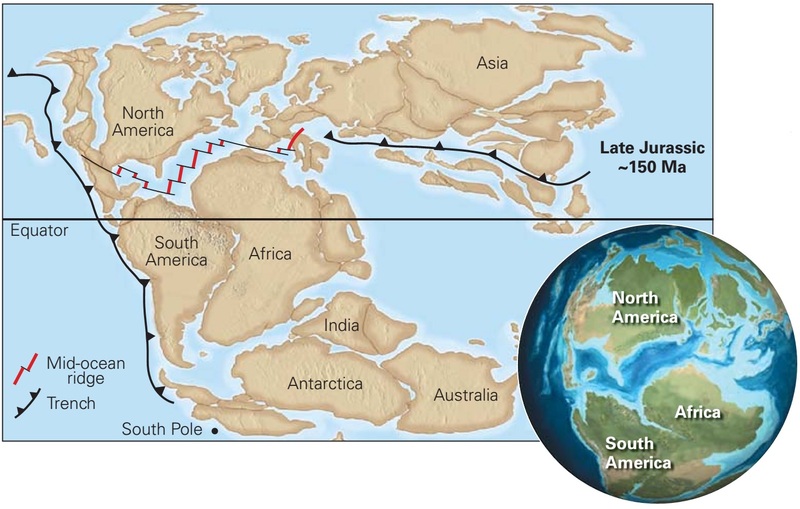 The Atlantic Ocean continued to grow because of sea-ﬂoor spreading on the Mid- Atlantic Ridge, and thus the Americas have moved westward, away from Europe and Africa. Meanwhile, the continents that once constituted Gondwana drifted northward as the intervening Tethys Ocean was consumed by subduction. 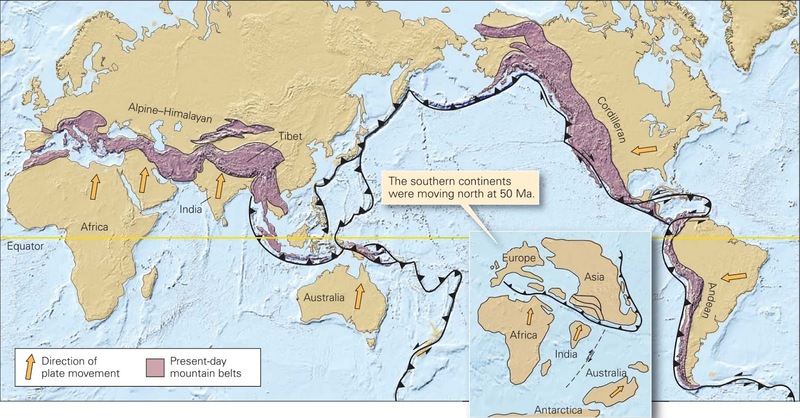 Collisions of the former Gondwana continents with the southern margins of Europe and Asia resulted in the formation of the largest orogenic belt on Earth today, the Alpine-Himalayan chain (figure above). India and a series of intervening volcanic island arcs and micro-continents collided with Asia to form the Himalayas and the Tibetan Plateau to the north, while Africa along with some volcanic island arcs and micro-continents collided with Europe to produce the Alps. As the Americas moved westward, convergent plate boundaries evolved along their western margins. In South America, convergent-boundary activity built the Andes, which remains an active orogen to the present day. In North America, convergent-boundary activity continued without interruption until about 40 Ma (the Eocene Epoch), yielding, as we have seen, the Laramide orogeny. 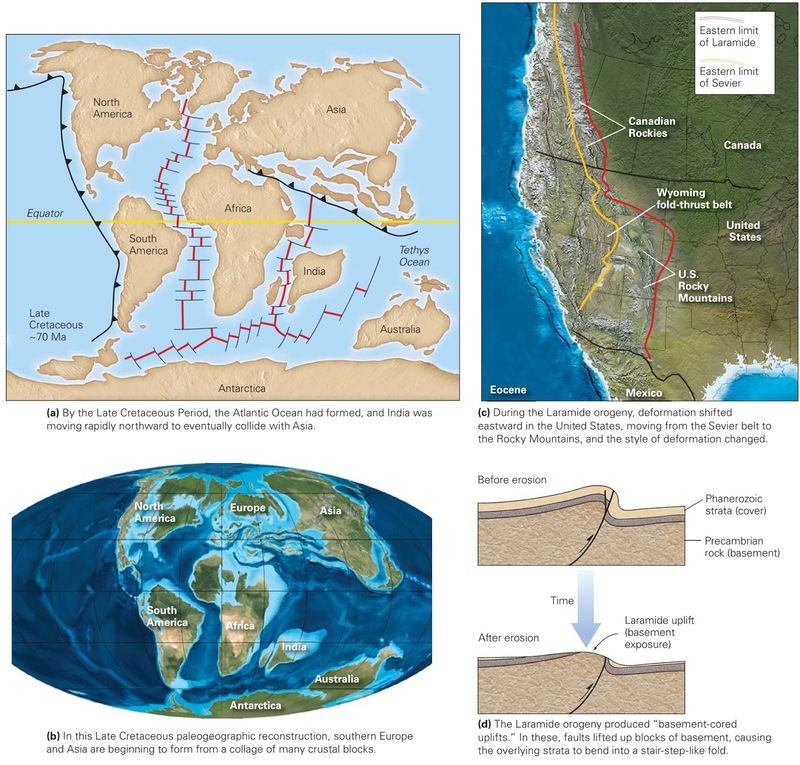 Then, because of the rearrangement of plates off the western shore of North America, a transform boundary replaced the convergent boundary in the western part of the continent by 25 Ma. When this happened, volcanism and compression ceased in western North America, the San Andreas Fault system formed along the coast of the United States, and the Queen Charlotte Fault system developed off the coast of Canada. Along the San Andreas and Queen Charlotte faults today, the Paciﬁc Plate moves northward with respect to North America at a rate of about 6 cm per year. 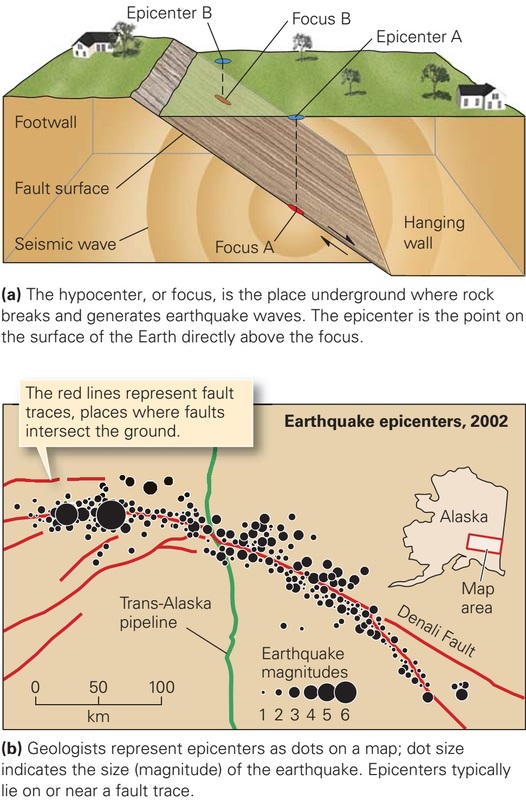 In the western United States, convergent-boundary tectonics continues only in Washington, Oregon, and northern California, where subduction of the Juan de Fuca Plate generates the volcanism of the Cascade volcanic chain. The Basin and Range Province is a rift. The inset shows a cross section along the red line. 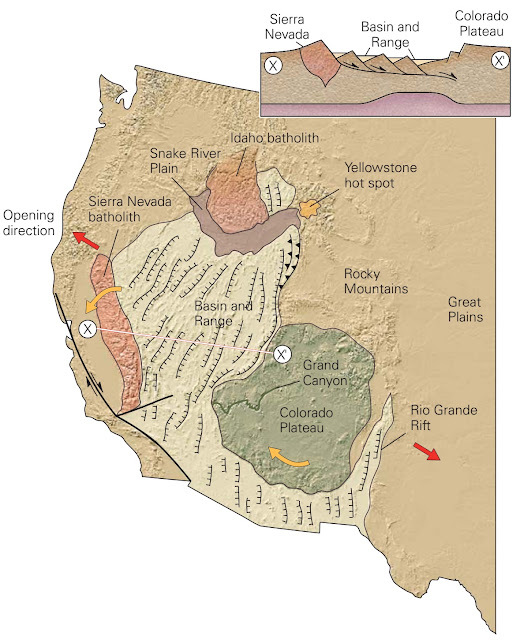 As convergent tectonics ceased in the western United States south of the Cascades, the region began to undergo rifting (extension) in roughly an east-west direction. The result was the formation of the Basin and Range Province, a broad continental rift whose development has stretched the region to twice its original width (figure above). The Basin and Range gained its name from its topography the province contains long, narrow mountain ranges separated from each other by ﬂat, sediment ﬁlled basins. This topography formed when the crust of the region was broken up by normal faults. Blocks of crust above these faults slipped down and tilted. Crests of the tilted blocks form the ranges, and the depressions between them, which rapidly ﬁlled with sediment eroded from the ranges, became basins. The Basin and Range Province terminates just north of the Snake River Plain, the track of the hot spot that now lies beneath Yellowstone National Park. As North America drifts westward, volcanic calderas formed along the Snake River Plain; Yellowstone National Park straddles the most recent caldera. Recall that in the Cretaceous Period, the world was relatively warm and sea level rose so that extensive areas of continents were submerged. During the Cenozoic Era, however, the global climate rapidly became cooler, and by the early Oligocene Epoch (34 Ma), Antarctic glaciers reappeared for the ﬁrst time since the Triassic. The climate continued to grow colder through the Late Miocene Epoch, leading to the formation of grasslands in temperate climates. About 2.5 Ma, the Isthmus of Panama formed, separating the Atlantic completely from the Paciﬁc, changing the conﬁguration of oceanic currents, perhaps leading the Arctic Ocean to freeze over. 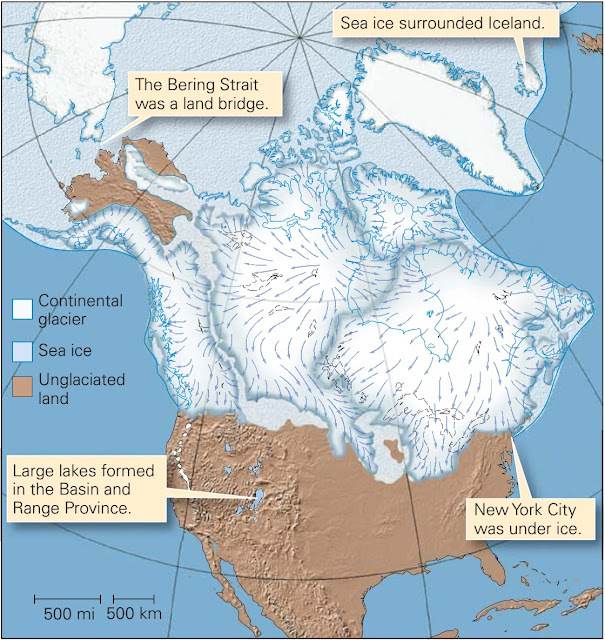 The maximum advance of the Pleistocene ice sheet in North America. During the overall cold climate of the past 2 million years, continental glaciers have expanded and retreated across northern continents at least 20 times, resulting in the Pleistocene Ice Age (figure above). Each time the glaciers grew, sea level fell so much that the continental shelf became exposed to air. At times, a land bridge formed across the Bering Strait, west of Alaska, providing migration routes for animals and people from Asia into North America. A partial land bridge also formed from southeast Asia to Australia, making human migration to Australia easier. Erosion and deposition by the glaciers created much of the landscape we see today in northern temperate regions. About 11,000 years ago, the climate warmed, and we entered the interglacial time interval we are still experiencing today. The present-day Bahamas serve as an example of what the interior of the United States might have looked like during intervals of the Paleozoic. 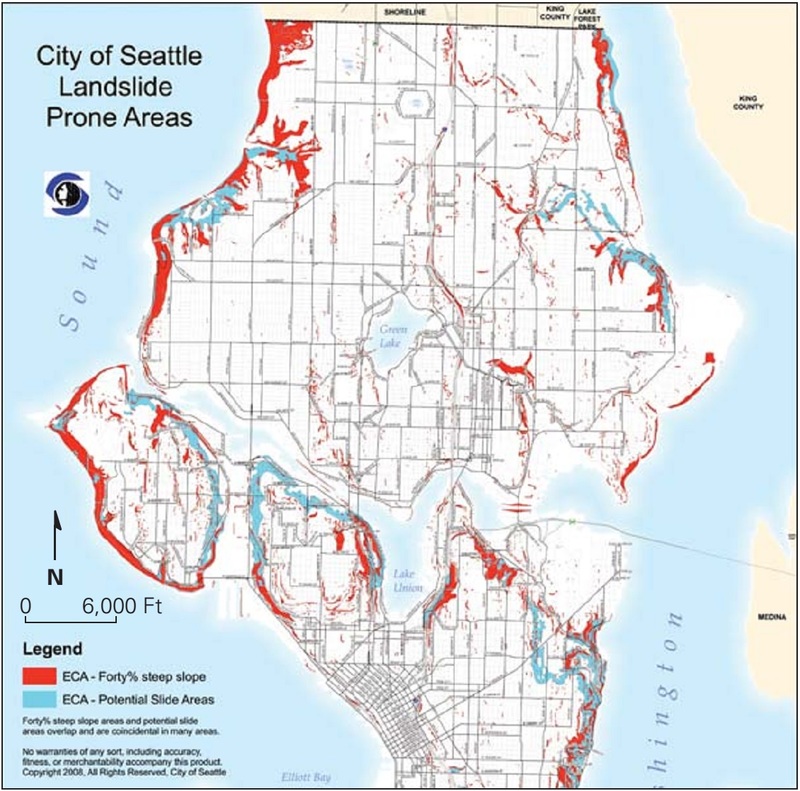 Shallow land areas were submerged and became the site of shallow-marine sedimentation. When the skies ﬁnally cleared in the wake of the K-T boundary catastrophe, plant life recovered, and soon forests of both angiosperms and gymnosperms grew. The grasses, which ﬁrst appeared in the Cretaceous, spread across the plains in temperate and subtropical climates by the middle of the Cenozoic Era, transforming them into vast grasslands. The dinosaurs, except for their descendants the birds, were gone for good. Mammals rapidly diversiﬁed into a variety of forms to take their place. In fact, most of the modern groups of mammals that exist today originated at the beginning of the Cenozoic Era, giving this time the nickname Age of Mammals. During the latter part of the era, huge mammals appeared (such as mammoths, giant beavers, giant bears, and giant sloths), but these became extinct during the past 10,000 years, probably because of hunting by humans. It was during the Cenozoic that our own ancestors ﬁrst appeared. Ape-like primates diversiﬁed in the Miocene Epoch (about 20 Ma), and the ﬁrst human-like primate appeared at about 4 Ma, followed by the ﬁrst members of the human genus, Homo, at about 2.4 Ma. Fossil evidence, primarily from Africa, indicates that Homo erectus, capable of making stone axes, appeared about 1.6 Ma, and the line leading to Homo sapiens (our species) diverged from Homo neanderthalensis (Neanderthal man) about 500,000 years ago. According to the fossil record, modern people appeared about 200,000 years ago, and initially shared the planet with two other species of the genus Homo, the Neanderthals and the Denisovans. The last Neanderthals and Denisovans died off over 25,000 years ago, leaving Homo sapiens as the only human species on Earth. Earth’s history reﬂects the complex consequences of plate interactions, sea-level changes, atmospheric changes, life evolution, and even meteorite impact. In the past few millennia, humans have had a huge effect on the planet, causing changes signiﬁcant enough to be obvious in the geologic record of the future. The Mesozoic Era where Dinosaurs were dominant spanned from 251-65 Ma. Pangaea began to break up in the Triassic, and by Jurassic time, a narrow North Atlantic Ocean existed. Pangaea, the super-continent formed at the end of the Paleozoic Era, existed for about 100 million years, until rifting commenced during the Late Triassic and Early Jurassic Periods and the super-continent began to break up. By the end of the Jurassic Period, rifting had succeeded in splitting North America from Europe and Africa. The Mid-Atlantic Ridge formed, and the North Atlantic Ocean started to grow (figure above). According to the record of sedimentary rocks, Earth overall had a warm climate during the Triassic and Early Jurassic. But during the Late Jurassic and Early Cretaceous, the climate cooled. Pangaea’s interior remained a non-marine environment in which red sandstone and shale, now exposed in the spectacular cliffs of Zion National Park, were deposited. By the Middle Jurassic Period, sea level began to rise, and a shallow sea submerged much of the Rocky Mountain region. On the western margin of North America, convergent margin tectonics became the order of the day. 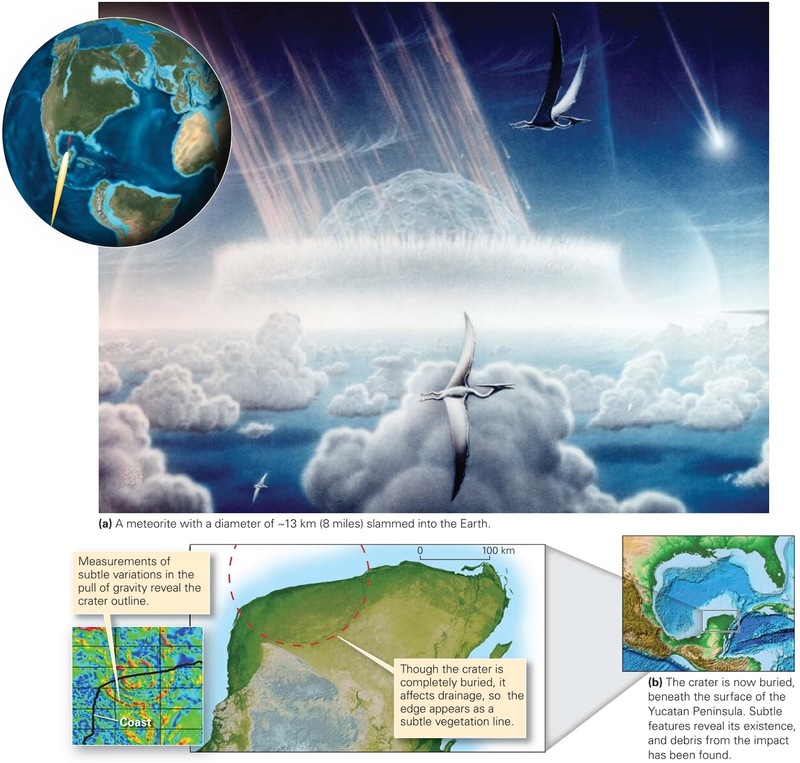 Beginning with Late Permian and continuing through Mesozoic time, subduction generated volcanic island arcs and caused them, along with micro-continents and hot-spot volcanoes, to collide with North America. Thus, North America grew in land area by the accretion of crustal fragments on its western margin. Because these fragments consist of crust that formed elsewhere, not originally on or adjacent to the continent, geologists call them exotic terranes. From the end of the Jurassic through the Cretaceous Period, a major continental volcanic arc, the Sierran arc, grew on the western margin of North America itself; you’ll learn more about this arc later. During the Jurassic, giant dinosaurs roamed the land. This painting shows several species. During the early Mesozoic Era, a variety of new plant and animal species appeared, ﬁlling the ecological niches left vacant by the Late Permian mass extinction. Reptiles swam in the oceans, and new kinds of corals became the predominant reef builders. On land, gymnosperms and reptiles diversiﬁed, and the Earth saw its ﬁrst turtles and ﬂying reptiles. And at the end of the Triassic Period, the ﬁrst true dinosaurs evolved. Dinosaurs differed from other reptiles in that their legs were positioned under their bodies rather than off to the sides, and they were possibly warm blooded. By the end of the Jurassic Period, gigantic sauropod dinosaurs (weighing up to 100 tons), along with other familiar examples such as stegosaurus, thundered across the landscape, and the ﬁrst feathered birds, such as Archaepteryx, took to the skies (figure above). The earliest ancestors of mammals appeared at the end of the Triassic Period, in the form of small, rat-like creatures. During the Cretaceous Period, the Earth’s climate continued to shift to warmer conditions, and sea level rose signiﬁcantly, reaching levels that had not been attained for the previous 200 million years. Great seaways ﬂooded most of the continents (figure above). In fact, during the latter part of the Cretaceous Period, a shark could have swum from the Gulf of Mexico to the Arctic Ocean, or across much of western Europe. Paleogoegraphy is Late Cretaceous through Eocene time. The breakup of Pangaea continued through the Cretaceous Period, with the opening of the South Atlantic Ocean and the separation of South America and Africa from Antarctica and Australia. India broke away from Gondwana and headed rapidly northward toward Asia (figure above a, b). Along the continental margins of the newly formed Mesozoic oceans, passive-margin basins developed that ﬁlled with great thicknesses of sediments. In western North America, the Sierran arc, a large continental volcanic arc that initiated at the end of the Jurassic Period, continued to be active. This arc resembled the present day Andean arc of western South America. Though the volcanoes of the Sierran arc have long since eroded away, we can see their roots in the form of the plutons that now constitute the granitic batholith of the Sierra Nevada Mountains. Compressional stresses along the western North American convergent boundary activated large thrust faults east of the arc, an event geologists refer to as the Sevier orogeny. This orogeny produced a fold-thrust belt whose remnants you can see today in the Canadian Rockies and in western Wyoming (figure above c). 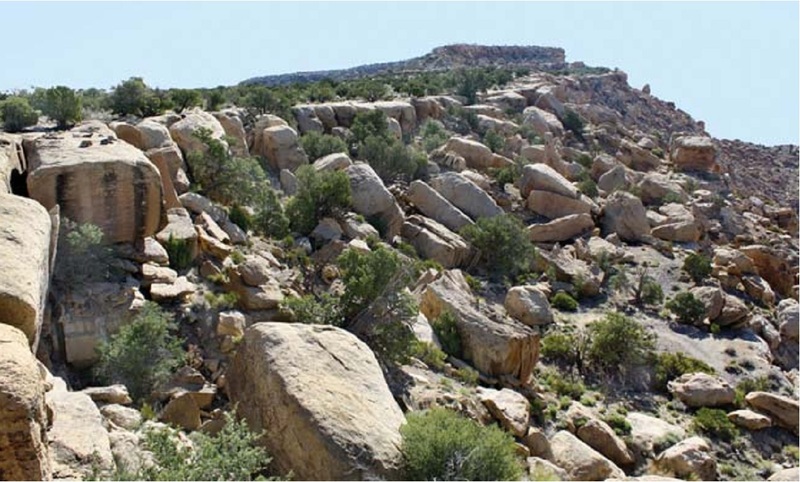 At the end of the Cretaceous Period, continued compression along the convergent boundary of western North America caused slip on large faults in the region of Wyoming, Colorado, eastern Utah, and northern Arizona. In contrast to the faults of fold-thrust belts, these faults penetrated deep into the Precambrian rocks of the continent, and thus movement on them generated basement uplifts (figure above d). Overlying layers of Paleozoic strata warped into large monoclines, folds whose shape resembles the drape of a carpet over a step. This event, which geologists call the Laramide orogeny, formed the structure of the present Rocky Mountains in the United States. Geologists have determined that sea-ﬂoor spreading rates may have been as much as three times faster during the Cretaceous than they are today. As a result, more of the oceanic crust was younger and warmer than it is today, and since young sea ﬂoor lies at a shallower depth than does older sea ﬂoor (due to isostasy; see Interlude D), Cretaceous mid-ocean ridges occupied more volume than they do today. The extra volume of the ridges displaced sea water, causing sea level to rise. Also during the Cretaceous, huge submarine plateaus formed from basalts erupted at hot-spot volcanoes. The existence of these plateaus implies that particularly active mantle plumes, or super plumes, reached the base of the lithosphere. Growth of submarine plateaus displaced sea water and thus also contributed to sea-level rise. Volcanism associated with extra-rapid sea-ﬂoor spreading, as well as with submarine plateau growth, likely released CO2 into the atmosphere. Geologists hypothesise that this increased atmospheric CO2 concentration led to a global rise in atmospheric temperature. Rising temperatures would cause sea water to expand and polar ice sheets to melt, both phenomena that would make sea level go up even more. Considering all the phenomena that caused sea level to rise during the Cretaceous, it’s no surprise that the continents ﬂooded and that large epicontinental seas formed during this era. In the seas of the late Mesozoic world, modern ﬁsh appeared and became dominant. In contrast with earlier ﬁsh, the new ﬁsh had short jaws, rounded scales, symmetrical tails, and specialised ﬁns. Huge swimming reptiles and gigantic turtles (with shells up to 4 m across) preyed on the ﬁsh. On land, cycads largely vanished, and angiosperms (ﬂowering plants), including hardwood trees, began to compete successfully with conifers for dominance of the forest. Dinosaurs reached their peak of success at this time, inhabiting almost all environments on Earth. Social herds of grazing dinosaurs roamed the plains, preyed on by the fearsome Tyrannosaurus rex (a Cretaceous, not a Jurassic, dinosaur, despite what Hollywood says). Pterosaurs, with wingspans of up to 11 m, soared overhead, and birds began to diversify. Mammals also diversiﬁed and developed larger brains and more specialised teeth, but for the most part, they remained small and rat-like. The Cretaceous tertiary impact. The aftermath probably caused extinction of the dinosaurs and other species. Geologists ﬁrst recognised the K-T boundary (K stands for Cretaceous and T for Tertiary) from 18th-century studies that identiﬁed an abrupt global change in fossil assemblages. Until the 1980s, most geologists assumed the faunal turnover took millions of years. But modern dating techniques indicate that this change happened almost instantaneously and that it represents a sudden mass extinction of most species on Earth. 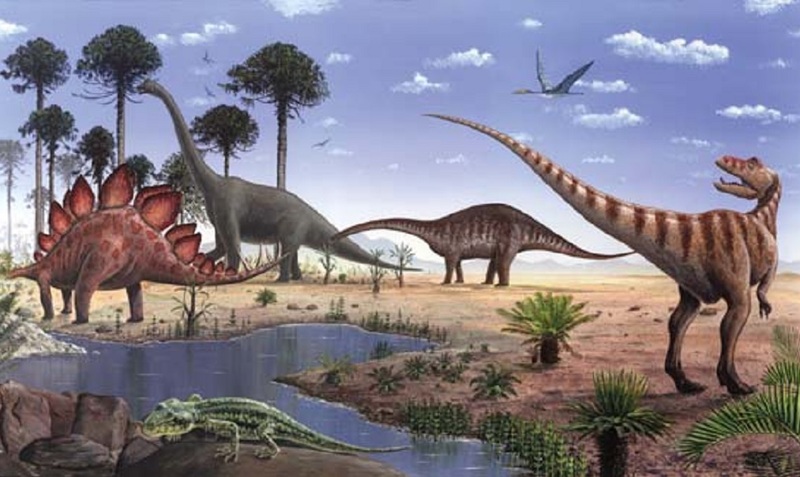 The dinosaurs, which had ruled the planet for over 150 million years, simply vanished, along with 90% of plankton species in the ocean and up to 75% of plant species. What kind of catastrophe could cause such a sudden and extensive mass extinction? The cause of the K-T mass extinction remained a mystery until the late 1970s, when Walter Alvarez, an American geologist, and his colleagues examined a shale layer deposited exactly at the K-T boundary. They found that this shale contained relatively high concentrations of iridium, an element that comes primarily from meteorites. Further study showed that the clays of this age contained other unusual materials, such as tiny glass spheres formed when a spray of molten rock freezes, grains of coesite (a mineral that forms when intense shock waves pass through quartz), and even carbon from burned vegetation. All these features pointed to the occurrence of a huge meteorite impact at the time of the K-T boundary. Subsequently, geologists found a 100-km-diameter and 16-km-deep meteorite crater buried beneath younger strata of the Yucatan Peninsula in Mexico (figure above a, b). Isotopic dating indicates that formation of the crater occurred at 65 o 0.4 Ma, the time of the K-T boundary event. Because of its age and size, this crater, known as the Chicxulub crater, may be the grave of the deadly object whose impact with Earth eliminated so much life. The impact caused so much destruction because it not only formed a crater, blasting huge quantities of debris into the sky, but probably also generated 2-km-high tsunamis that inundated the shores of continents and generated a blast of hot air that set forests on ﬁre. The blast and the blaze together could have ejected so much debris into the atmosphere that for months there would have been perpetual night and winter like cold. In addition, chemicals ejected into the air could have combined with water to produce acid rain. These conditions would cause photosynthesis to all but cease, and thus would break the food chain and trigger extinctions. The Paleozoic Era comprises of Cambrian to Ordovician Periods which time span is 542-251 Ma. Land and sea in the early Paleozoic Era. At the beginning of the Paleozoic Era, Pannotia broke up, yielding smaller continents including Laurentia (composed of North America and Greenland), Gondwana (South America, Africa, Antarctica, India, and Australia), Baltica (Europe), and Siberia (figure above a). New passivemargin basins formed along the edges of these new continents. In addition, sea level rose, so that vast areas of continental interiors were ﬂooded with shallow seas called epicontinental seas (figure above b). These regions are now cratonic platforms. In many places, water depths in epicontinental seas reached only a few meters, creating a well-lit marine environment in which life abounded. Deposition in these seas, therefore, yielded layers of fossiliferous sediment. Sea level, however, did not stay high for the entire early Paleozoic Era; regressions and transgressions took place, the former marked by unconformities and the latter by accumulations of sediment. The layer cake of strata in the Grand Canyon is rock formed from such sediment. The geologically peaceful world of the early Paleozoic Era in Laurentia abruptly came to a close in the Middle Ordovician Period, for at this time its eastern margin rammed into a volcanic island arc and other crustal fragments. The resulting collision, called the Taconic orogeny, deformed and metamorphosed strata of the continent’s margin and produced a mountain range in what is now the eastern part of the Appalachians (figure above c). A museum diorama illustrates what early Paleozoic marine organisms may have looked like. trilobites were grazing the sea ﬂoor. Trilobites shared the environment with mollusks, brachiopods, nautiloids, gastropods, graptolites, and echinoderms (figure above). Thus, a complex food chain arose, which included plankton, bottom feeders, and at the top, predators. Many of the organisms crawled over or swam around reefs composed of mounds of sponges with mineral skeletons. 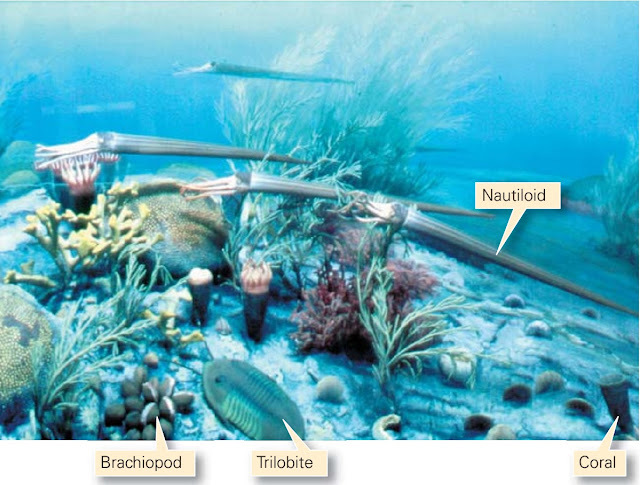 The Ordovician Period saw the ﬁrst crinoids and the ﬁrst vertebrate animals, jawless ﬁsh. At the end of the Ordovician, mass extinction took place, perhaps because of the brief glaciation and associated sea-level lowering of the time. 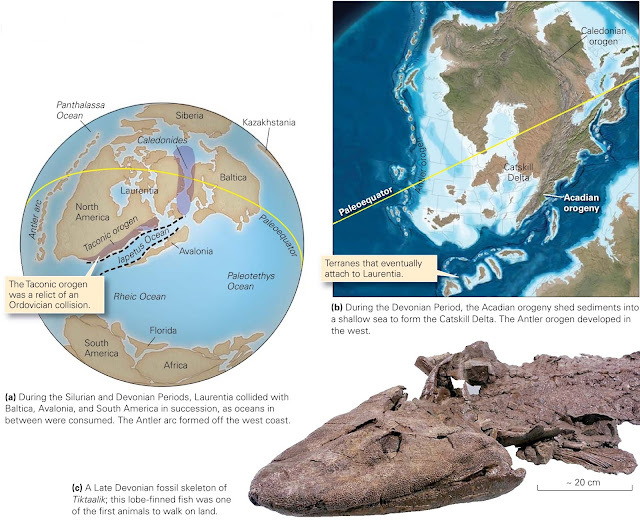 Paleogeography and fossils of Silurian and Devonian time . As the world entered the Silurian Period, global climate warmed, sea level rose, and the continents ﬂooded once again. In some places, where water in the epicontinental seas was clear and could exchange with water from the oceans, huge reef complexes grew, forming a layer of fossiliferous limestone on the continents. Also, distinct orogenies took place, yielding new mountain belts during the middle Paleozoic Era. For example, collisions on the eastern side of Laurentia during Silurian and Devonian time produced the Caledonian orogen (affecting eastern Greenland, western Scandinavia, and Scotland) and the Acadian orogen in the region that is now the Appalachians (figure above a). Throughout much of the middle Paleozoic, the western margin of North America continued to be a passive-margin basin. 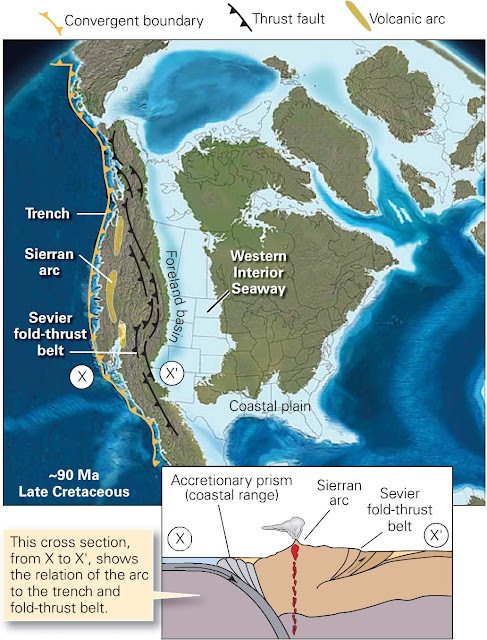 Finally, in the Late Devonian, the quiet environment of the west-coast passive margin ceased, possibly because of a collision with an island arc. This event, known as the Antler orogeny, was the ﬁrst of many orogenies to affect the western margin of the continent. The Caledonian, Acadian, and Antler orogenies all shed deltas of sediment onto the continents; these deposits formed thick successions of red beds, such as those visible today in the Catskill Mountains (figure above b). Life on Earth underwent radical changes in the middle Paleozoic Era. In the sea, new species of trilobites, gastropods, crinoids, and bivalves replaced species that had disappeared during the mass extinction at the end of the Ordovician Period. On land, vascular plants with woody tissues, seeds, and veins (for transporting water and food) rooted for the ﬁrst time. With the evolution of veins and wood, plants could grow much larger, and by the Late Devonian Period the land surface hosted swampy forests with tree-sized relatives of club mosses and ferns. Also at this time, spiders, scorpions, insects, and crustaceans began to exploit both dry-land and freshwater habitats, and jawed ﬁsh such as sharks and bony ﬁsh began to cruise the oceans. Finally, at the very end of the Devonian Period, the ﬁrst amphibians crawled out onto land and inhaled air with lungs (figure above c). Paleogeography at the end of the Paleozoic Era. The climate cooled signiﬁcantly in the late Paleozoic. Seas gradually retreated from the continents, so that during the Carboniferous Period, regions that had hosted the limestone-forming reefs of epicontinental seas now became coastal areas and river deltas in which sand, shale, and organic debris accumulated. In fact, during the Carboniferous Period, Laurentia lay near the equator, so it enjoyed tropical and semitropical conditions that favored lush growth in swamps. This growth left thick piles of plant debris that transformed into coal after burial. Much of Gondwana and Siberia, in contrast, lay at high latitudes, and by the Permian Period became covered by ice sheets. The late Paleozoic Era also saw a succession of continental collisions, culminating in the formation of a single supercontinent, Pangaea (figure above a). The largest collision occurred during Carboniferous and Permian time, when Gondwana rammed into Laurentia and Baltica, causing the Alleghanian orogeny of North America (figure above b). 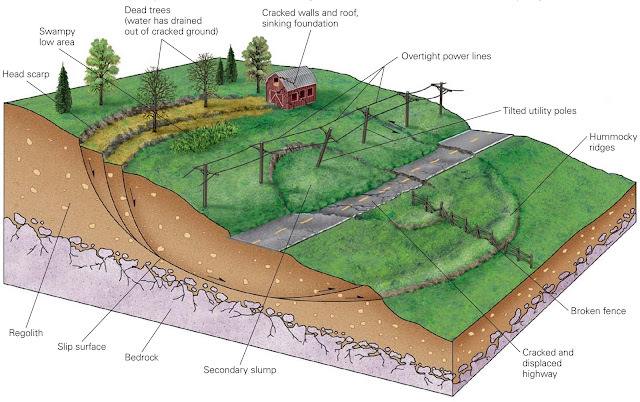 Features of the Appalachian Mountains in the eastern United States. During this event, the ﬁnal stage in the development of the Appalachians, eastern North America rammed against northwestern Africa, and what is now the Gulf Coast region of North America squashed against the northern margin of South America. A vast mountain belt grew, in which deformation generated huge faults and folds. We now see the eroded remnants of rocks deformed during this event in the Appalachian and Ouachita Mountains. Along the continental side of the range, a wide band of deformation called the Appalachian fold-thrust belt formed (figure above). Movement on the faults displaced strata and resulted in the formation of large folds. At depth, the thrust faults merged with a near-horizontal sliding surface, called a detachment, just above the Precambrian basement. Stresses generated during the Alleghanian orogeny were so strong that preexisting faults in the continental crust clear across North America became active again. 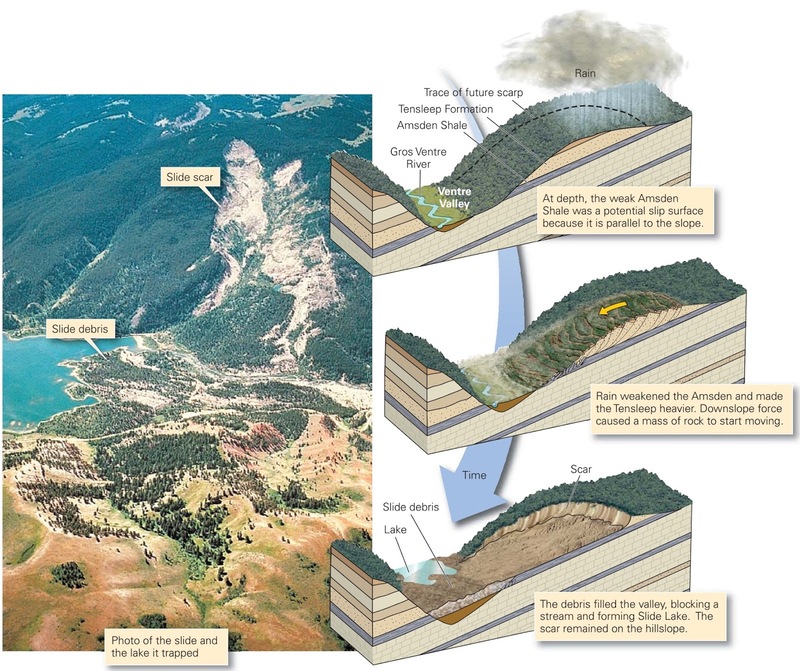 The movement produced uplifts and sediment-ﬁlled basins in the Midwest and in the region of the present-day Rocky Mountains. Geologists refer to the late Paleozoic uplifts of the Rocky Mountain region as the Ancestral Rockies. The assembly of Pangaea involved a number of other collisions around the world as well. Notably, Africa collided with southern Europe to form the Hercynian orogen. Also, a rift or small ocean in Russia closed, leading to the uplift of the Ural Mountains, and parts of China along with other fragments of Asia attached to southern Siberia. 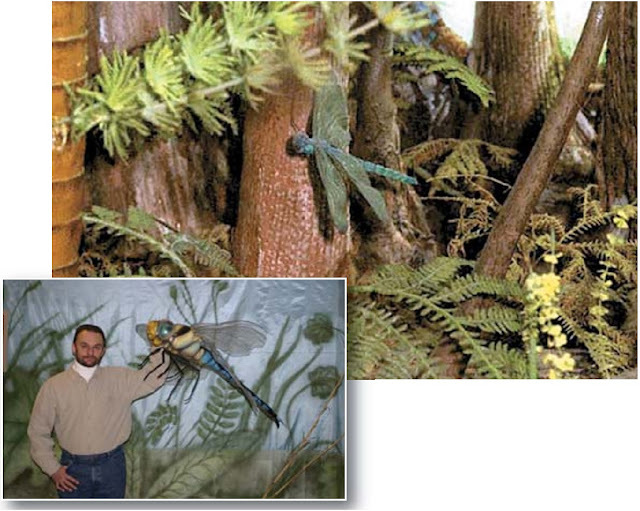 A museum diorama of a Carboniferous coal swamps includes a giant dragonfly, with a wingspan of about 1 m.
The insect photo gives series of its size relative to human. The fossil record indicates that during the late Paleozoic Era, plants and animals continued to evolve toward more familiar forms. In coal swamps, ﬁxed-wing insects including huge dragonﬂies ﬂew through a tangle of ferns, club mosses, and scouring rushes, and by the end of the Carboniferous Period insects such as the cockroach, with foldable wings, appeared (figure above). Forests containing gymnosperms (“naked seed” plants such as conifers) and cycads (trees with a palm-like stalk and fern-like fronds) became widespread in the Permian Period. Amphibians and, later, reptiles populated the land. The appearance of reptiles marked the evolution of a radically new component in animal reproduction: eggs with a protective covering. Such eggs permitted reptiles to reproduce without returning to the water. The late Paleozoic Era came to a close with a major mass extinction event, during which over 95% of marine species disappeared. Why this event occurred remains a subject of debate. 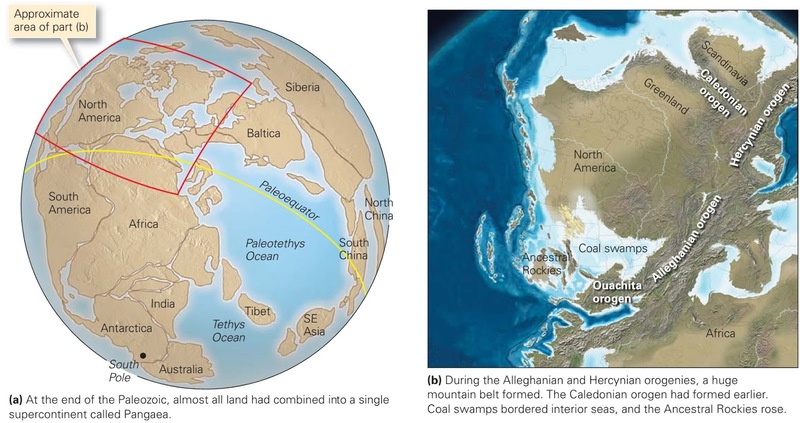 According to one hypothesis, the terminal Permian mass extinction occurred as a result of an episode of extraordinary volcanic activity in the region that is now Siberia; basalt sheets extruded during the event are known as the “Siberian traps.” Eruptions could have clouded the atmosphere, acidiﬁed the oceans, and disrupted the food chain.